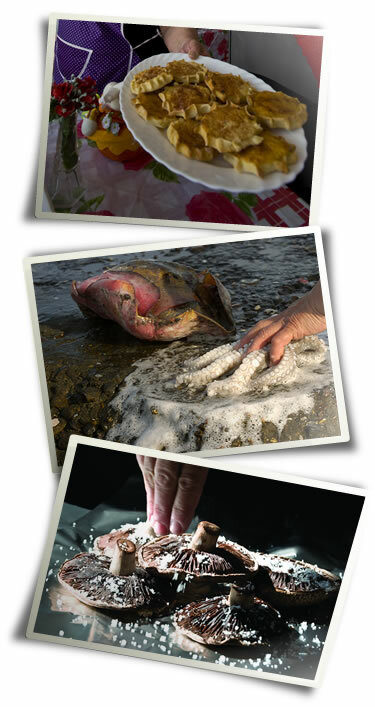 Parian cuisine is based on sea and land products. It is rich in fish, vegetables, greens and pulses, while meat is less frequently consumed. These products are cooked in oil and accompanied by local wine. What is really impressive is the variety in preparation methods as well as the ingredients’ imaginative mixing. Wild greens, poppies, nettles, shepherd’s needles, radishes, sow thistles, spiny chicories, euphorbia, wild lettuces, burnets, spinach beets, fennel, wild leek, notchweed and many more are eaten in many ways. Boiled greens dressed with oil and lemon are served as a salad. Sizzled greens are used in omelets and also serve as pie filling. Greens are also served with fresh or salt preserved fish like cod with spinach beets and cuttlefish with spinach. They are also harmoniously cooked with meat for the Sunday table: lamb fricassee, pork with amaranth, lamb with artichokes and broad beans. Honey and scented herbs (oregano, sage, thyme) offer every taste a unique smell, while caper, sea fennel and pigweed add flavour to refreshing salads. 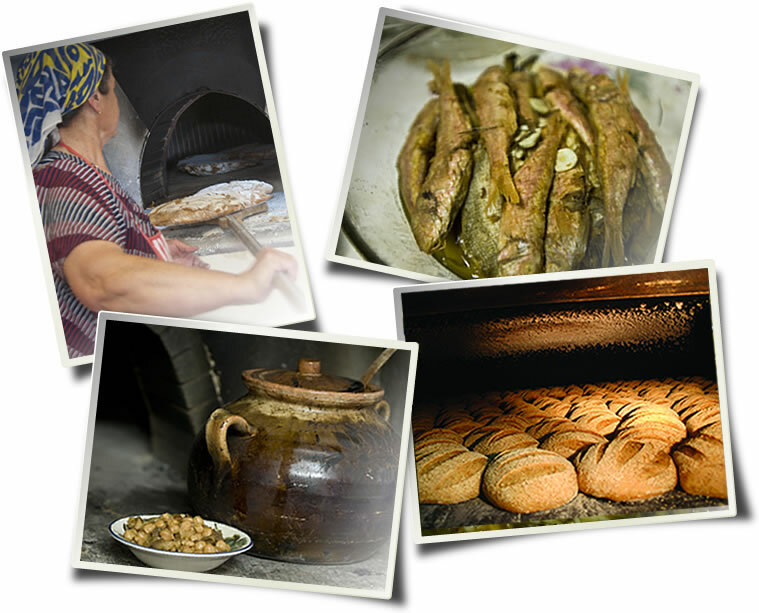 Favorite Parian dishes are the following: chick peas baked in the oven in a clay pot, kakavia (fish and vegetable soup), gouna (sun-cured, salt preserved fish), salatouri (ray fish salad), kolokythokeftedes (courgette balls), domatokeftedes (tomato balls), string beans, pantrema tou fava (mashed split peas with onion), karavoli (snails) and kalfa (kind of green beans) with skordalia (garlic dip), stuffed vine leaves, stewed snails or snails with mirmitzeli (homemade orzo pasta), cod with spinach, hare casserole with onions and many more. Mushrooms are a favorite titbit for food lovers.The Parians adore them and share them with friends without revealing though the place where they pick them. This is kept secret sealed. Mushrooms, the so called meat of the poor, are eaten either floured and fried or grilled but always sprinkled with lemon. With the Parian fishing fleet being the biggest in the Cyclades, fish can’t but have a dominant role in local cuisine: scorpion fish and dracaena fish, squids, cuttlefish, lobsters, marida (whitebait), octopus, bonito fish, small tuna, bogue, sargus, sea bream fish, red mullets, snappers. Exquisite cheeses like xinomizithra, ladotiri (olive oil cheese), tiri tis armis (cheese conserved in brine), touloumisio (cheese aged in goat skin), and mizithra (hard cheese) enhance the flavor of local dishes. The exceptional bread, for which Parian bakeries are known, together with paximadia (thick rusks), or kritharokouloures (barley loaves) make local cuisine uniquely tasty. Women use their imagination and combine all kinds of fruits to make spoon sweets & marmalade while rafiolia, mizithropitakia (small sweet pies), lambrokouloura, lazarakia (Easter cookies), petimezegni and skaltsunia sweeten the palate. Paros figs have a reputation for being delicious and are used for making «samota» ( dried figs with sesame and cinnamon) or «pastelaria» ( dried figs with almond pith and sesame), as well as fig spoon sweet.